Burholme Golf and Family Entertainment Center is the perfect place for your child's birthday party or any community gathering. We redesigned our café with just that purpose in mind. 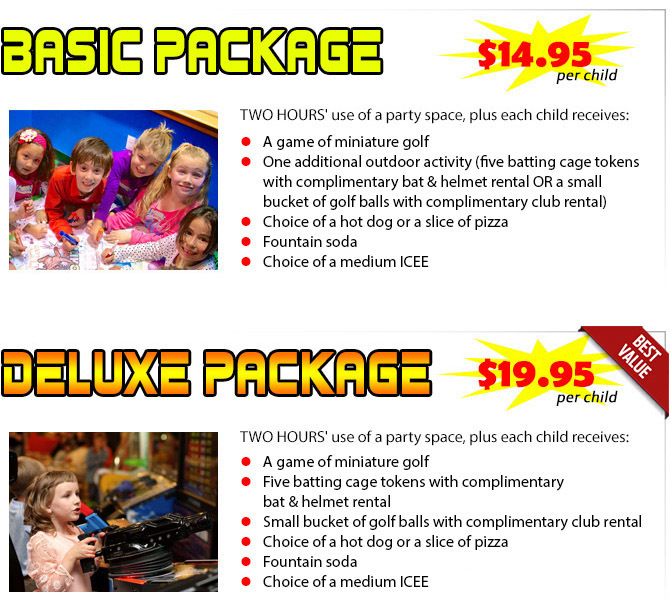 We've also added a party room that can be reserved on a first-come, first-serve basis! Plus we can host additional parties in the café. In addition to birthday parties, we can also host business and civic outings. We will provide basic paper goods and plastic utensils free of charge. Parties may bring theme plates, balloons and other decorations if they choose. Parties may also bring a cake or ice cream cake. We can provide a knife, and can refrigerate the cake for you if desired. No other outside food, please. Extra pizzas can be purchase at $15 per pie, plus we have a full snack bar to serve you. Parties can be scheduled to start 9:00 am through 5:00 pm, seven days per week. The minimum party size is ten participants. A $50.00 deposit is required at least one week prior to the scheduled event date. Call us today at (215) 742-2380 to make a reservation for your party or group!